THE Philippine Atmospheric, Geophysical and Astronomical Services Administration (Pagasa) Davao said weather disturbances and changes in weather pattern push tropical depressions and typhoons to Southern Mindanao. In the previous years, Davao Region was a typhoon-free area and was rarely visited by typhoons but recently, there have been weather disturbances and change of weather patterns. In fact, Pagasa Davao said it has been almost half a century since the last typhoon made landfall in Malita, Davao Occidental. In 2013, Typhoon Crising hit Davao del Sur, while Typhoon Pablo in Baganga town in Davao Oriental landed in 2012. Jojo Tabuclaon, observer 4 of Pagasa Davao, said in an interview Tuesday that it was very unusual for a tropical depression to land in the southern part of Mindanao after Chedeng moved towards Davao Occidental. Based on their data, it was in 1970 when Typhoon Titang landed in the same town which claimed hundreds of lives. Chedeng landed in the Southern part because of the high pressure area in Luzon and the Northeast Monsoon which pushed Tropical Depression Chedeng downward instead of going up, the usual direction of the storm entering the Philippine Area of Responsibility. 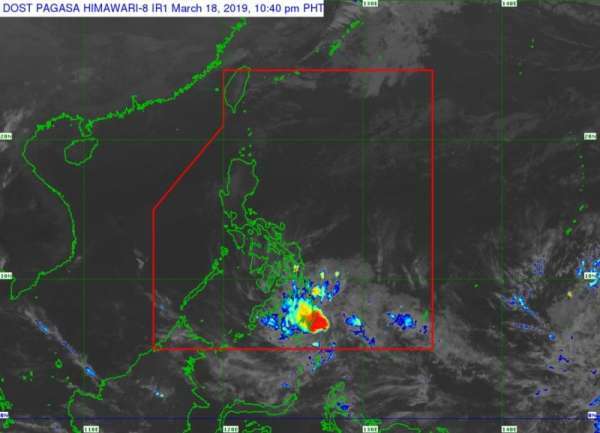 The weather bureau announced that Tropical Depression Chedeng landed in Malita, Davao Occidental around 5:30 a.m. Tuesday, March 19, but it weakened into a low pressure area (LPA). Around 8 a.m. of the same day, the LPA was already at the vicinity of Malungon, Sarangani. Scattered to at times widespread moderate to heavy rains were experienced over most parts of Mindanao, especially over Surigao del Sur, Agusan del Sur, Davao Region, Soccsksargen, and portions of Bangsamoro and Zamboanga Peninsula. Meanwhile, Lieutenant George Maganto, commander of the Philippine Coast Guard-Davao, said that after Pagasa issued its latest weather update, effective 9:30 a.m. Tuesday, all vessels and watercrafts plying Sta. Ana pier to Kaputian and vice versa; Sta. Ana pier to Talikud and vice versa and all island hopping have resumed to its normal operation.